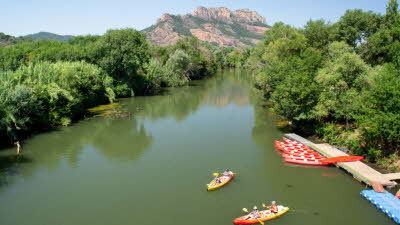 This site appeals to those who appreciate natural surroundings, with a beautiful setting just inland from the coast and bordered by the River Argens, where you can canoe. 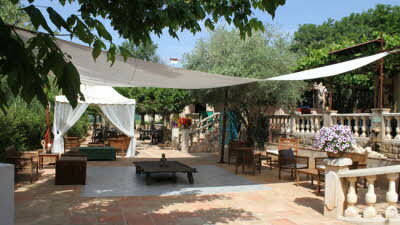 Charming Provençal buildings house the bar, restaurant and games room. A lake across the road has a sandy beach and a restaurant, while onsite there are swimming and paddling pools and spa facilities including a Jacuzzi, sauna and massage treatments. You won’t be short of things to do in the area – there are guided trips to climb Roquebrune Rock, and organised excursions to Monte Carlo and the Gorges du Verdon. 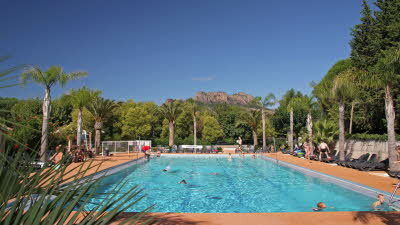 The pretty village of Roquebrune-sur-Mer is a short distance away, and a bus service stops outside the site entrance and runs to Fréjus and the nearby beaches. 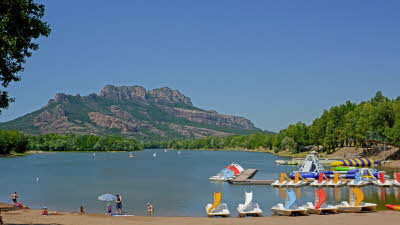 Roquebrune-sur-Argens, Fréjus, Agay, Cannes, Nice, Saint Tropez, Grasse, Monaco, Water parks, Vineyards, Diving, Horse riding, Golf, Cycle routes. From the A8 take exit 36 (signed Draguignan/St Tropez) After the tolls continue on the D1555/N555 towards Draguignan after 0.6miles/1km take the exit DN7 signed Frejus/St Raphael. 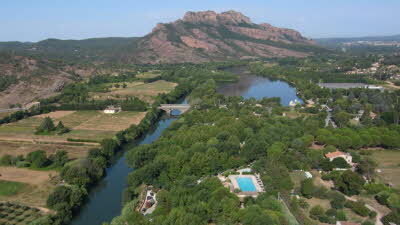 Continue on the DN7/D7 for 4.9miles/8km passing by Le Muy and following signs to Roquebrune. 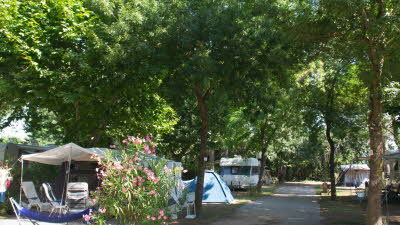 The site entrance will be on the left hand side of the D7 before you reach Roquerune-sur-Argens. Firstly I would agree with some of the negative points raised in previous reviews. We visited in 2016 and stayed in a mobile home so did not suffer the issues some of the reviewers saw but we did walk around the site and talk to people in caravans/ Motorhome. 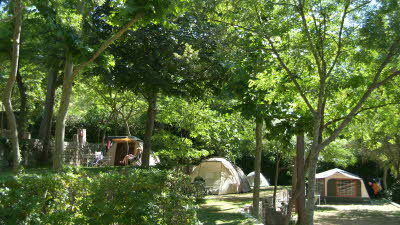 As far as we were concerned the accommodation was great; the site staff were very helpful and the location is perfect. We visited the beach and nearby towns on public transport and had no problems. We did visit in late June/ early July so the site was far from full. Drove to beaches and had no problems parking. The beaches were excellent. Went on walks/ visits organised by the site and they were great with English spoken. Felt a bit embarrassed as guy taking these seemed to give us a much more detailed explanation of things than he did to the French speaking people. There was some entertainment organised in the evenings and we did attend the usual French campsite sort of show that if it was in UK we would think was terrrible but in France just seems fine. Just returned and were unimpressed. Staff were polite but appeared to have their hands tied by management. On arrival we were given a pitch but told we could have any in that area. The pitch wasn’t big enough for caravan and awning. A larger second pitch couldn’t be accessed even using a mover. A pitch was found where we could put van and awning, it was overgrown, full of dust and weeds (as was all of them), nice when the wind blew. We tied back branches to prevent them rubbing the van. The car went on a nearby pitch. We too would be interested to know when the site was last inspected. Initially we didn’t know of pitches to the rear of the site, we were given a photocopied map which didn’t include them. We later became aware and they are nicer, larger and easier to access and there were 3 vans present. We were denied them due to flood risk, so why were any vans parked there? 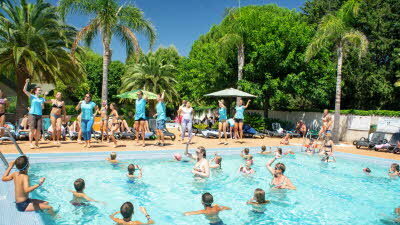 There were also sports amenities and a childrens play area. Showers were clean, gave 8 secs of water per buttonpress and we had to ‘kiss’ the wall to get under it. Temperatures varied Filling a 40-litre container took ages. Dishwashing gave lukewarm water. Waste disposal is a toilet bowl, try lifting and emptying a full waste container. The camp wasn’t peaceful. The adjacent road was busy, a lane running alongside was noisy early and late. We paid extra for a family pitch but were told the pitches were the same price same size. I contacted the Club about this and will be writing, we weren’t the only ones who thought they’d get a larger pitch. On arrival we paid 20 euro deposit for a cardkey. When we left the staff had no cash access to return our deposit. Club website states there’s mini golf, day entertainment all season, fishing and play area for kids. No entertainment. No golf and no fishing was found. The play area was in the area not on the map. Plus side. Pool area is very nice, includes an adult only area with whirlpools. Could also do with parasols. 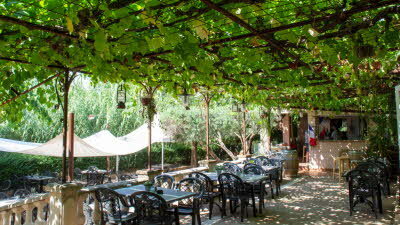 Might get overcrowded high season Very welcoming restaurant beautifully located and supplied good food at decent prices. Toilets and showers were clean, no soap or toilet paper. Friendly site shop, but very small with little choice. Intermarche is a mile away. 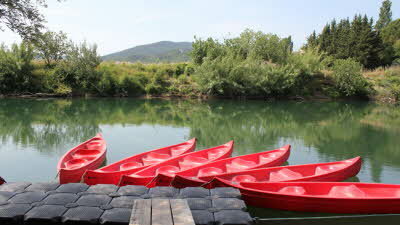 Free canoes, it’s worth a paddle the river is teaming with wildlife including turtles. Cannes (30 miles) take the cliffside/sea route from Frejus absolutely stunning. St Maxime (8 miles) easiest area to park for beaches (some free), Port Grimaud and St Tropez (15miles) both beautiful. Take a trip up into the mountains too. Pretty disappointed. We expected better than a cramped, dust bowl for our stay. Compounding this was the exclusion from the rear area. It’s not the first time we’ve been aggrieved by the description of the Clubs European sites and question if we will bother in future. At home they are absolutely fine but I think they need to be more honest with sites abroad or whoever visits and appraises these places needs talking too. We are the owners of the twin axle referred to below by 'millielou'. 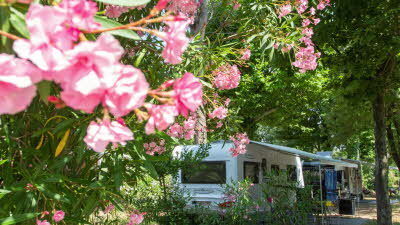 We had driven from mid France to get here on our first venture abroad with the caravan. Arriving at 5.00pm we also were greeted with the golf buggy trip to show us our pitch; this was an utter joke as even if we had a motor mover fitted, there was no way a twin axle was going to fit! These pitches are pretty disgusting, very claustrophobic, and need a good tidy up. Whilst discussing the predicament with the operative who had shown us the pitch, the resident Brits took an interest, and that is when we heard about the much larger pitches. Sabine, the site manager then became involved, saying that the larger pitches were 'out of use' for historic reasons relating to the 2007 flood (check out the devastation!). Much discussion followed including Sabine phoning the owner, and my wife becoming very distressed. Extremely poor customer interaction. We eventually managed to get one of the larger pitches! We will be writing to the CMC to provide our feedback. On a positive note, this site is positioned ideally for the Cote D'azur. 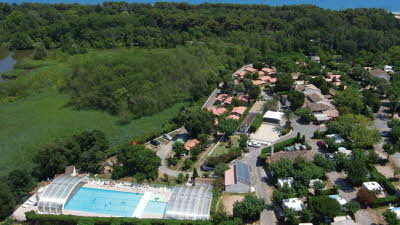 Get the train from Les Arcs (plenty of parking) to visit Nice, Monaco etc. St Tropez 45mins by road. Gorge de Verdun fantastic! This site could be brought back to an excellent standard by some investment. There is a deposit of 20 euro for cardkey entry for car. We also paid the tourist tax direct. We had a buggy ride to a pitch, which was VERY snug. Thank goodness for motor movers we definitely would not have got this in without it. There were four pitches in each "bay" and cars were parked to one side of the bay together. Pitches were flat, but we felt very cramped and the site was only half full. We did have enough room to put our caravan canopy up but the pitch had no shade and it was extremely hot whilst we were there. Some of the pitches were 3pin 10 amp electricity connection, however ours was euro plug. I found it difficult to fill the aquaroll as the water taps had a high concrete base, so it was easier to top up with a 5 litre water bottle, which we carry to fill the toilet flush. Restaurant was open all day, which was a bonus. We had two takeaway pizzas for 22 euros, which were very tasty. The bar/restaurant staff were lovely and very helpful. 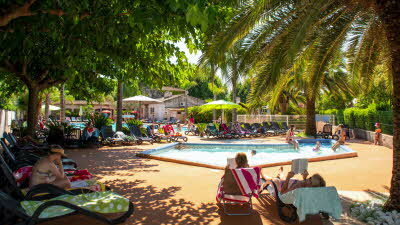 The pool area was amazing, although no parasols for shade. Jacuzzi's, sauna, etc and an adult only pool which was stunning. No swim shorts and shoes left just inside the pool area (usual for continental sites). Shower facilities were ok - the only problem was the temperature was set and could not be changed. Communal entrance. Bread, etc can be bought in the campsite shop - very friendly and no need to pre-order. Recycling facilities just outside the entrance. The area was beautiful and the rock reminded me of Sedona, in USA. Probably wouldn't go back, as it lacked something - do not know what.